I’ve always leaned towards the hustlers over the inherited. Meaning, scrappy entrepreneurs with drive and hutzpah are my passion and purpose. They don’t have Angel Investors, VC funding, or a trust fund to rely on. Every dollar they spend has to come back to them as more or they don’t survive. So every minute and every dollar counts. Yet so many small businesses aren’t sure what their marketing is doing for them. Are they wasting money? Or is it helping their business? It is why so many are hesitant to spend money on social media marketing. Will it produce the return they were looking for? Or waste their hard-earned dollars? Take one of our clients – Dave Dee. Dave is a sales and marketing expert and coach. He launched his own business after years of working for someone else. He needed clients and cash. He had an email list for a while, but it was getting kind of stale. Those on his list weren't responding as much as he wanted/needed, and he wasn't profiting from it. He knew he ought to grow his email list. Like so many of us who want more people on our list, Dave wanted to develop a bigger audience, and have more people to sell to – meaning more people to hear his messaging. He was nervous because he didn't have the budget of American Express or Pepsi, or even some of the big marketers who can spend a ton of cash with little risk. He was nervous. How much money was he going to waste? Was he going to be throwing his hard-earned money away? We created a system that addressed this fear and crushed it. First, we started with a Facebook Ad offering a “juicy carrot.” We want people to bite on a juicy carrot, because juicy carrots are what attracts many bunnies, and we want those bunnies to multiply. The bunnies want that carrot so bad that they are willing to give their contact information in exchange. In Dave’s case, what was the juicy carrot? It was a free seven-figure sales template. That's the juicy carrot we wanted them to bite on. When folks click through to the landing page, the real magic happens. On this page most people would simply say, “Thanks for requesting the blueprint. It's on its way.” But here’s where Dave is making money on his lead generation. On his thank you page instead of simply thanking new list members, he offers them a program that he previously sold for $500, now made available to them for only $47. There's an offer right on the thank you page: “If you want to move forward, you can have an opportunity for this one time only to get this course for $47.” The results are incredible. Dave is getting almost 10% of people who reach this page to buy this course, and we are able to bring in leads for less than $4 each, which means he is actually making money. The results have been officially amazing. Out of 2,210 webinar template downloads, his cost per download was $3.31, making his total spend $7,306.52. When 193 people purchased the template, his total revenue came to just over $9,000. What does that mean? These numbers are crushing it. His net cost to add 2,210 new people to his email list was $0. His profit generated was $1,764.48. My company runs a similar funnel. 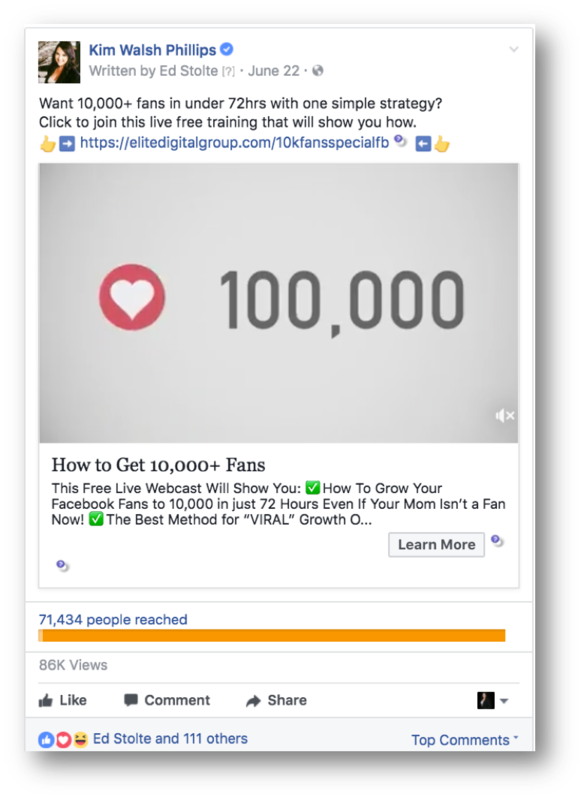 It starts with a juicy carrot of a free 3-day training on how to get 10,000 Facebook Fans in 72 hours at 3daysto10k.com. On the thank you page, visitors can purchase a recording of the training. We are converting 22% of all leads into customers, right from the thank you page. Not only does this mean we are actually profiting from our marketing, but it also means we are getting the contact information from our leads willingly because in order to purchase, they are supplying not just their name and email but also a mailing address and phone number. Since running this campaign, we have brought in 6,073 new leads and increased our revenue 103% over last year. Stop leaving money on your table. Begin with your “Juicy Carrot” and start profiting while you generate new leads and customers today.